Ford Otosan is the market leader in the overall commercial vehicles segment with a 28.7% market share. Ford Otosan reached the highest sales volume in its history in 2015. Having completed its capital investments and launched new models in 2014, Ford Otosan advanced from strength to strength in 2015 with new facilities, setting records in sales and production. Strong domestic demand and the robust pace of sales translated into a 35% increase in sales over the prior year. Ford Otosan's domestic market share ticked up led by the commercial vehicles segment, with the Company taking 12.5% of the overall market in 2015 to rank second sector-wide. 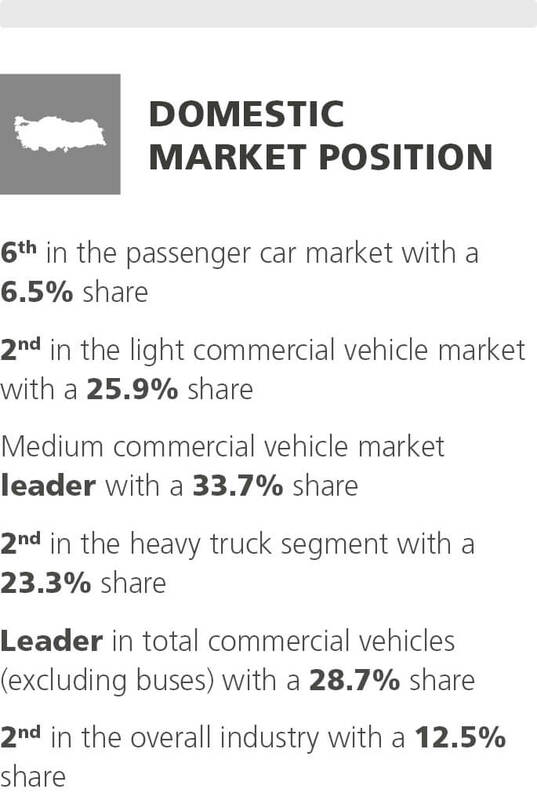 Meanwhile, the Company captured a 28.7% share of the commercial vehicles market, and remained the sector leader. In the passenger car segment, with the introduction of new models, Ford Otosan grew above sector with 26% rise in sales and achieved 6.5% market share. Due to the ongoing growth in the Company's export markets, and the Ford brand's leadership in the European commercial vehicle market as result of its strategy focused on market share growth, Ford Otosan posted record-breaking exports of 253,644 vehicles for the year. As a result, the Company translated its four-year export champion title in the automotive sector to national leadership in 2015. 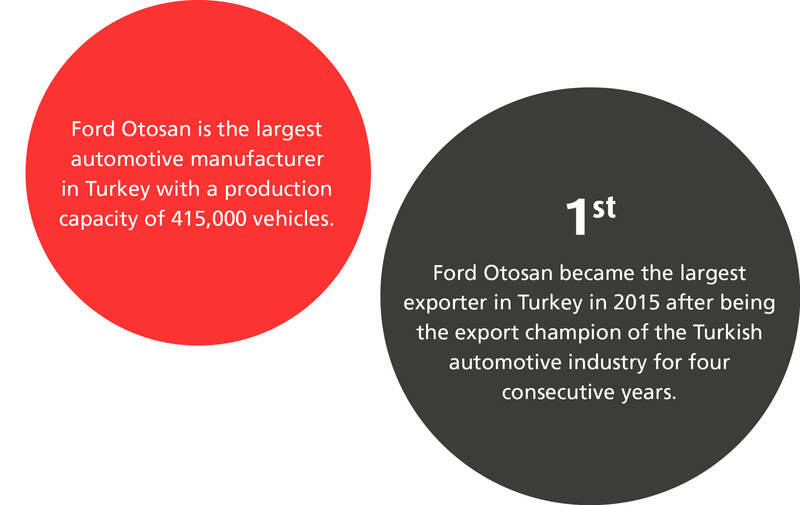 Ford Otosan is Turkey's largest automotive manufacturer. The Company boasts a total annual production capacity of 415 thousand vehicles: 400 thousand at the Kocaeli factories and 15 thousand at the İnönü facility. Record sales in the domestic market coupled with robust overseas markets and strong sales of the Company's newly launched products enabled Ford Otosan to post an all-time high sales volume of 379,039 units in 2015. In parallel, the Company's manufacturing output also hit a record level of 334,622 units, with a total capacity utilization of 81% on three shifts. As Turkey's largest commercial vehicle manufacturer and exporter, Ford Otosan operates five campuses and three head offices. 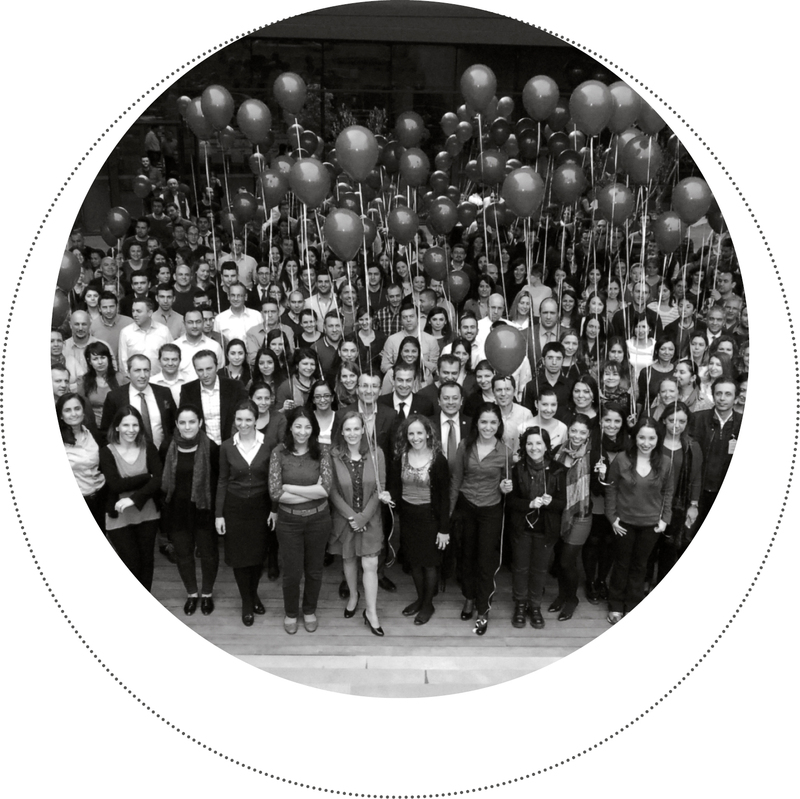 With 10,676 employees at year's end, the Company remained an employment champion and continued to create significant value for the country and its stakeholders. 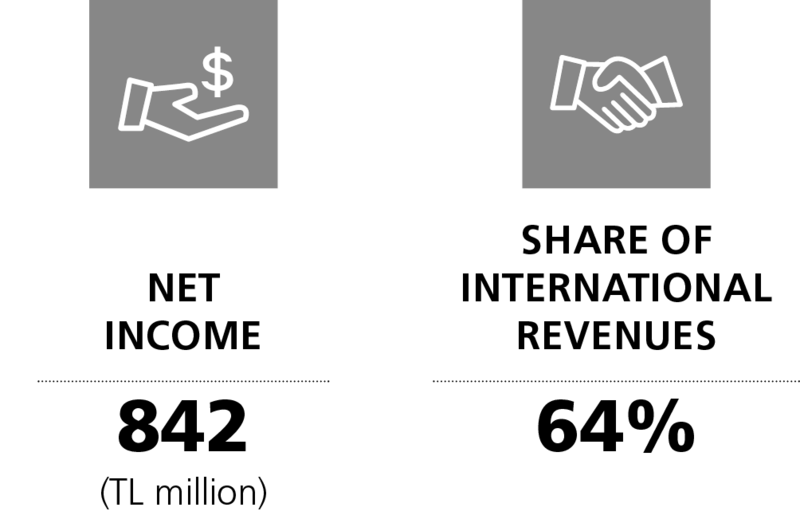 The success of new products translated into substantial growth in operational and financial performance. 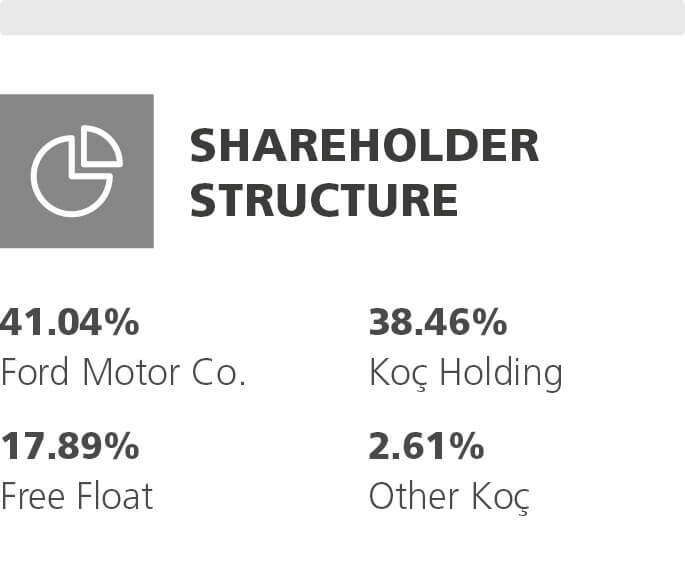 As a result, Ford Otosan bolstered its cash flow and the Company made a total annual dividend payment of TL 400 million in two installments. As part of the Company's growth strategy in heavy commercial vehicles, Ford Otosan expanded its network across the country to 27 locations as of year-end 2015, largely completing its sales and service restructuring in Turkey. Reorganization of the overseas dealer network also continued, as it grew to 19 facilities in 15 countries. Ford Otosan plans to continue expanding its overseas dealer network in the period ahead. Ford Otosan, which is Ford's global engineering center for heavy commercial vehicles and related diesel engine and engine systems, is also a support center for light commercial vehicle design and engineering. While Gölcük Engineering Center focuses on engines and vehicle tests; Ford Otosan's technology and R&D center in Sancaktepe, the largest in the Turkish automotive sector, works on the development of trucks, engines and engine systems. Sancaktepe R&D Center, opened in 2015, was certified by the Ministry of Science, Industry and Technology, becoming Ford Otosan's second R&D Center. Ford Otosan, with its 56 year history, is a technology company, having a perfect business model with vehicle and engine manufacturing capability, high engineering competency, competitive R&D organization and experience in exporting engineering. The Company continues to raise its level through new projects and investments. Upon completion of the capital investments at the Kocaeli Factories, all production lines and vehicles were launched as planned. At the İnönü Factory, R&D process investments in truck testing track and engine test dynamometer continue, as well as investments in engines and trucks. After setting a record in 2015 by selling over 1 million vehicles, the Turkish automotive industry is expected to demonstrate a similar performance in 2016, despite a minor deviation due to the high base year effect. The industry has positive expectations for Europe, Ford Otosan's main export market, for the commercial vehicles segment of up to 3.5 tons. Thanks to the strong market share performance of the Ford brand, the Company aims to maintain its export growth drive and raise its capacity utilization rate. 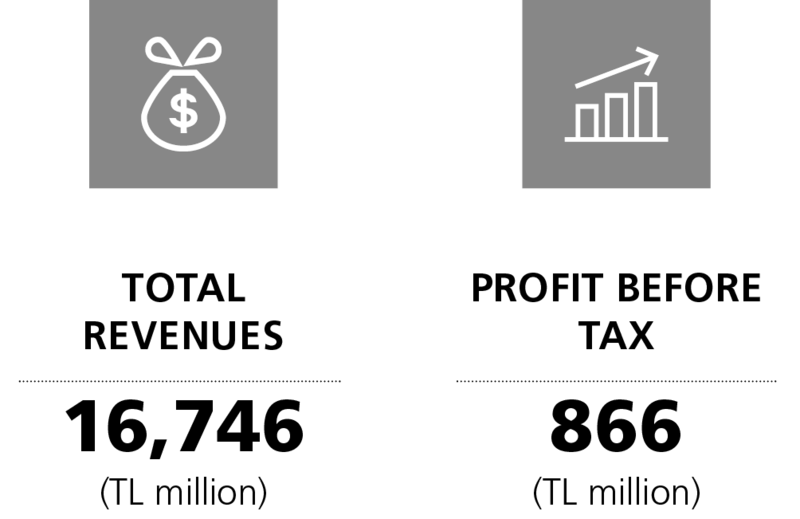 As a result of efforts to reduce costs, Ford Otosan is also expected to increase its profitability.